Many purchasers swore by the Scarpa Fuego’s tanklike durability. Dozens of wearers loved the boot for being quite the versatile footgear. The Fuego was praised by scores of owners for its majestic comfort. This Scarpa footwear quelled the worries of numerous users with its supportive ankle shaft. A decent percentage of Fuego reviewers only had great things to say about the boot and its remarkable lightness. Several mountaineers never lost their footing on uneven terrain in their Fuegos, and they couldn’t be any happier. Less than a handful of buyers admitted that their purchase of the boot was a wise investment. Reviewers by the dozen were annoyed by the boot’s unyielding stiffness. Many users got extremely disappointed with the Scarpa Fuego’s long break-in period. About a handful of Scarpa fans detested the boot’s default insole for lacking enough cushioning. Mountaineering in the Scarpa Fuego means walking over rugged terrain in an outstandingly comfortable and ankle-supportive boot. It’s an impressively durable and versatile piece of climbing gear. Unfortunately, not everyone would appreciate this boot outright as reports concerning its ultra-stiff construction and long break-in period might be enough to turn them away. All in all, if mountaineers can give the boot enough time to loosen up, they would eventually discover how magnificently well-made the Scarpa Fuego really is. If you’re looking for boots that are absolutely made up to battle with you and are crafted like a disguised tank shaped like shoes, this offering from Scarpa Fuego is the one to beat. The Fuego is a sturdy alpine climbing footgear designed with an over-the-ankle collar for support. Its leather upper’s suede finish gives the boot a classic look. Offering cushioning and stability on rough terrain is the boot’s ethylene-vinyl acetate (EVA) midsole. What gives users traction on different types of surfaces, on the other hand, is the Vibram M4 Tech outsole. 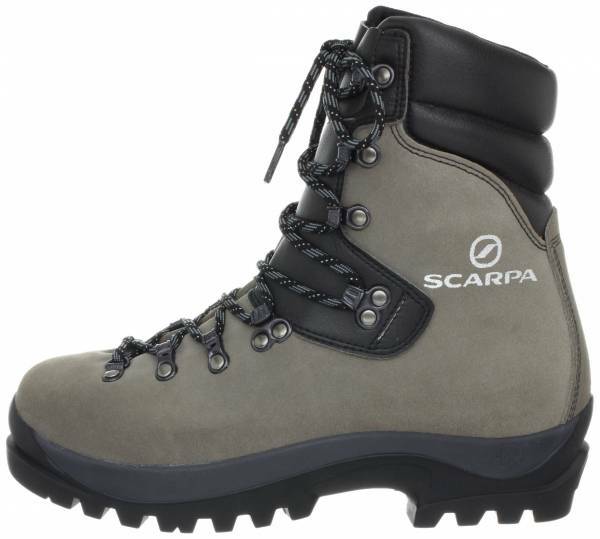 Scarpa’s Fuego is a high-cut, adequately true-to-size, unisex mountaineering boot. It is offered in D – standard width in a decent number of whole and half sizes. For female buyers, going one size down is recommended. It is built on the DL last, giving the boot a broader fit and higher overall volume. Its closure system provides personalized lockdown configurations. With the Vibram M4 Tech serving as the boot’s outsole, wearers gain a secure foothold over terrain types characterized by severe ruggedness. This aggressively lugged and treaded component is based on the mountaineering-specific Mont compound which grants it a level of performance in extremely cold environments. The boot also has a protective tip thanks to the outsole’s forefoot extension. The Scarpa Fuego’s contoured midsole is one made of EVA—a foam possessing qualities such as high elasticity, stress resistance, and low-temperature toughness. Its cushiness is improved upon by the boot’s Pro-Flex XT insole. This removable cushioned footbed is also breathable, thanks to its perforated forefoot zone. Scarpa engineers gave the Fuego a Crosta Pro HS12 leather upper, having a thickness of 2.8 mm. It is protected with textured leather overlays starting from the ankle line all the up to the boot’s uppermost eyelets. Its tongue has a seamless construction for debris protection. This sturdy upper is also imbued with the Taibrelle liner, making the footwear’s interior airy and comfortable. Securely riveted to the upper are metallic eyelets the upper half of which are open hooks. The boot’s laces are completely synthetic.